The respiratory system arises from buds on the ventral anterior foregut endoderm (AFE) that undergo a stereotyped branching process followed by specialization of the airway epithelium in the stalks while, distally, alveoli develop where gas exchange will take place. We have published a strategy to achieve the generation of developmental lung progenitors from hPSCs. These were capable of further differentiation into airway and, predominantly, distal lung cells in 2D cultures. Recapitulation of lung development from human pluripotent stem cells (hPSCs) in three dimensions (3D) would allow innovative strategies for disease modeling, drug discovery and regenerative medicine. 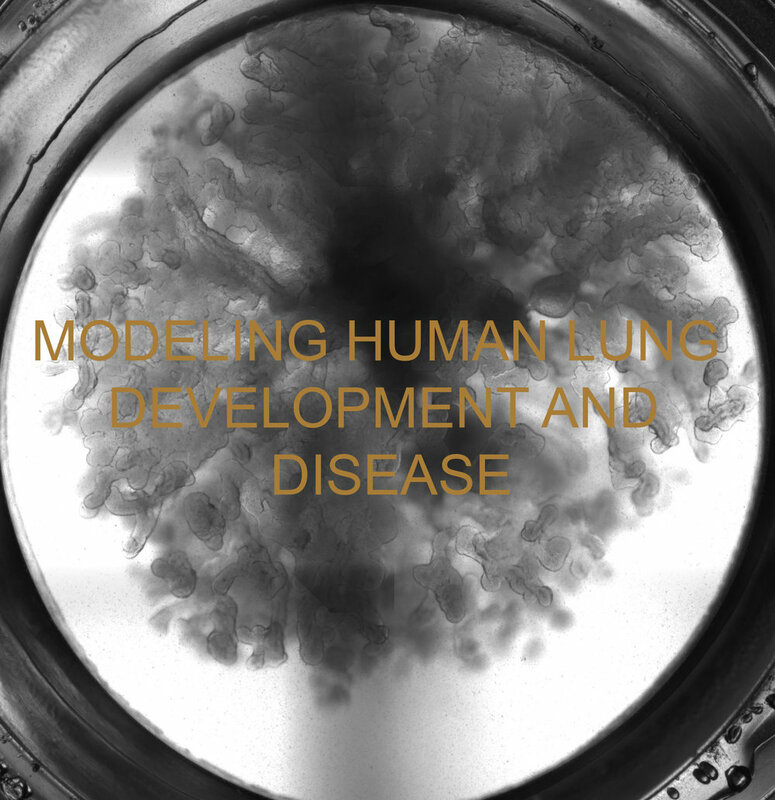 While organoids containing a variety of lung and airway epithelial cells have been generated from hPSCs, a 3D system that emulates lung development and allows disease modeling has not yet been realized. We developed a culture system where lung bud organoids (LBOs) are generated from hPSCs that develop into branching airway and alveolar structures after xenotransplantation. In 3D culture LBOs undergo branching morphogenesis and distal lung development. We are currently using these models to examine mechanisms underlying alveolar epithelial cell specification and establishment of alveolar architecture. Further studies also focus on mechanisms of proximodistal specification, with a focus on the generation of basal cells, and as well cell fate choices during terminal alveolar development. The generation of proximal airway stem cells (basal cells) would a major advance in the modeling and treatment of cystic fibrosis. An important focus is modeling of idiopathic pulmonary fibrosis (IPF). IPF is an intractable lung disease with a median survival of 3-4 years. 30-40,000 Americans die from this disease each year. As currently no curative treatments are available except for lung transplantation, innovative approaches are urgently needed. Developing such approaches requires insight into pathogenesis. The nature of some predisposing mutations strongly suggests a key role for dysfunction of surfactant-producing type II alveolar epithelial (ATII) cells. Our LBO model allowed recapitulation of fibrosis in hPSCs with engineered mutations that predispose with high penetrance to IPF, thus allowing investigation of pathogenesis and eventually establishment of drug screens. Furthermore, we are modeling viral infection of the lung using these models. Green M, Chen A, Nostro MC, d’Souza S, Schaniel C, Lemischka IR, Gouon-Evans V, Keller G, Snoeck HW. (2011). Generation of anterior foregut endoderm from human embryonic and induced pluripotent stem cells. Nat. Biotechnol., 29:267-272. Huang SX, Islam MN, O’Neill J, Hu Z, Yang Y-Y, Chen Y-W, Green MD, Mumau M, Vunjac-Novakovic G, Bhattacharya J, Snoeck HW. (2014) Highly efficient generation of lung and airway epithelial cells from human pluripotent stem cells. Nat Biotechnol., 32:84-91. Huang SX, Green M, Toste A, Mumau M, Chen YW, Snoeck HW (2015) Protocol of for the generation of lung and airway epithelial cells from human pluripotent stem cells. Nat. Protocols, 10:413-425. Ciancanelli M, Huang SX, Luthra P, Garner H, ITan Y, Volpi S, Trouillet C, Schmolke M, Isrealsson E, Herman M, Hermesh T, Lorenzo L, Albrecht RA, Leung LW, Okada S, Picard C, Ringuier B, Troussier F, Chaussabel D, Abel L, Pellier I, Notarangelo LD, Garcai-Sastre A, Basler CF, Geissmann F, Zhang SY, Snoeck HW, Casanova JL (2015) Impaired innate and intrinsic IFNα/β amplification underlies life-threatening influenza in human inherited IRF7 deficiency. Science, 348:448-553. Chen YW, Huang SX, Rodrigues Toste de Carvalho AL, Ho SH, Islam MS, Volpi S, Notarangelo LS, Ciancanelli M, Casanova LS, Bhattacharya J, Liang AF, Palermo LM, Porotto M, Moscona A, Snoeck HW. (2017) A three-dimensional model of human lung development and disease from pluripotent stem cells. Nat Cell Biol., 19:542-549.